haverhillchamber.com | Gr. 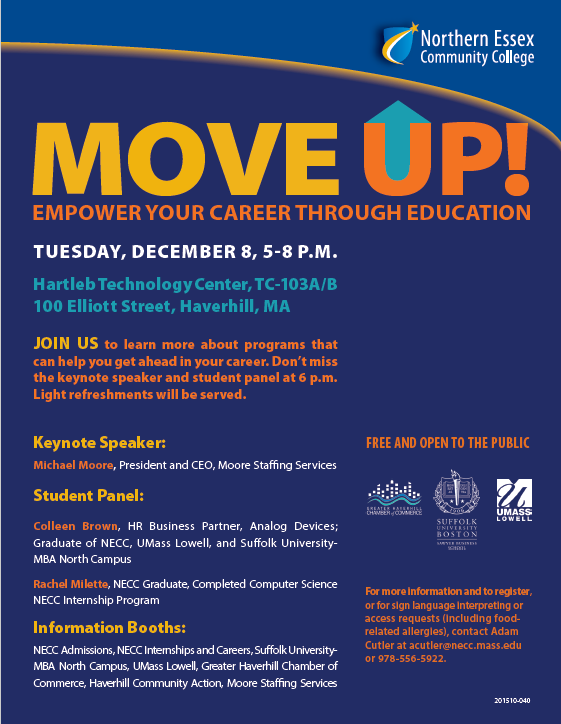 Haverhill Chamber Collaborates with NECC, UMass Lowell and Suffolk University to present Move Up! Expo. Gr. 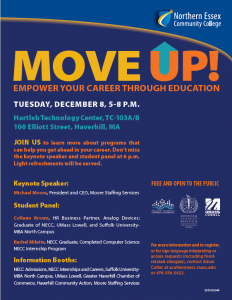 Haverhill Chamber Collaborates with NECC, UMass Lowell and Suffolk University to present Move Up! Expo. The Greater Haverhill Chamber of Commerce, in partnership with the University of Massachusetts – Lowell, Suffolk University and Northern Essex Community College, will offer an interactive expo designed to introduce and inform attendees to resources necessary for career advancement. On Tuesday, December 8, 2015 all interested are invited to join us from 5-8 p.m. at Northern Essex Community College’s Hartleb Technology Center, TC-103A/B, at 100 Elliott Street, Haverhill. This expo style event, “Move Up! Empower Your Career Through Education,” will familiarize attendees with the programs that can help you get ahead in your career. Light refreshments will also be served. This event is FREE and open to the public. There will be a keynote speaker and student panel beginning at 6 p.m. Michael Moore, President and CEO, Moore Staffing Services will provide a deeper understanding of the needs and concerns of employers engaged in hiring. Additional tips for best interviewing practices will also be reviewed. The student panel will answer questions and offer tactics for employment success. The panel will consist of Colleen Brown, HR Business Partner, Analog Devices; Graduate of NECC, UMass Lowell, and Suffolk University-MBA North Campus and Rachel Milette, NECC Graduate, Completed Computer Science NECC Internship Program. The following will also have Information Booths: NECC Admissions, NECC Internships and Careers, Suffolk University-MBA North Campus, UMass Lowell, Greater Haverhill Chamber of Commerce, Haverhill Community Action and Moore Staffing Services. For more information and to register, or for sign language interpreting or access requests (including food related allergies), contact Adam Cutler at acutler@necc.mass.edu or 978-556-5922; or by contacting Beverly Donovan at the Chamber office at 978-373-5663 or Beverly@haverhillchamber.com. For information about other Chamber events please email info@haverhillchamber.com.